The VW Passat offers one of the largest and most comfortable interiors within its class. 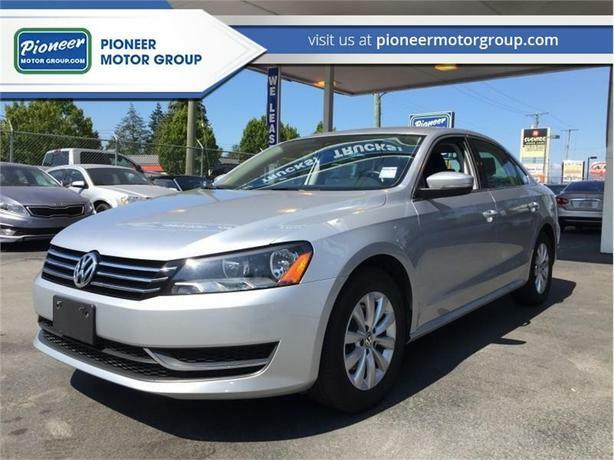 This 2015 Volkswagen Passat is for sale today in Maple Ridge. The 2015 Volkswagen Passat provides a refreshing alternative to the usual mid-sizers, offering a huge interior and the segment's only diesel engine option. Updates for the 2015 VW Passat include a new diesel engine in TDI models that is rated up to 44 mpg, while a rearview camera is now available in S and Wolfsburg trims. SEL Premium trims gain rain-sensing windshield wipers. Volkswagen Passat is a solid choice for a family sedan.This sedan has 45374 kms. It's silver in colour. It has an automatic transmission and is powered by a 170HP 1.8L 4 Cylinder Engine. It may have some remaining factory warranty, please check with dealer for details.